Battle Stance – Lasts until cancelled. When I started this blog 9.5 years ago I didn’t know yet if I would stick to it. Time and again I debated whether a domain made sense or not. Now I decided it’s time to do the jump and not wait until the 10 years are full, so here it is. Battle Stance, formerly known as Armagon Live. The content won’t change, the history is fully imported, just the URL is different. I guess I’ll have to tweak some of the CSS because I’m not yet 100% happy with the theme. Happy reading. Big news in the last week. I did finally manage to finish all the ARR content and I’m now finally in Ishgard. Because of this slog I was also busy doing quite a lot of other things. 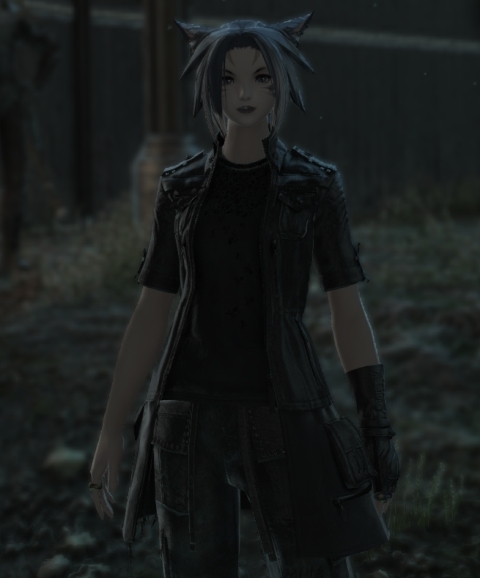 Ishgard is… grey. But the quests aren’t bad so far, but also not really awesome. Let’s see. 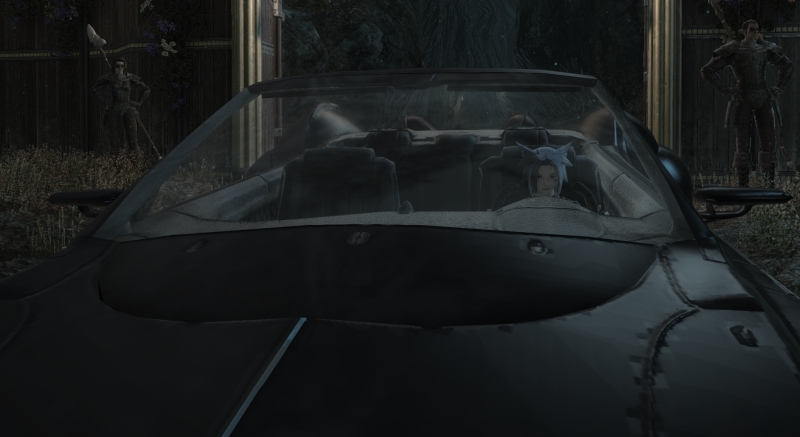 In reverse chronological order I finished the FFXV crossover event last night, and Hatching-Tide a few days ago. 25 Gladiator – more tanking! Been a while since I posted an update on leveling progress (main server). Focusing currently on the 29 Orc Rogue in small 30-60min doses, started the BE Priest (Shadow is not very fun right now) and the Human Rogue. Recent progression: Dwarf Hunter 60-80, Dwarf Shaman 80-91, created the Draenei DK. It’s not that I’m not having fun in FFXIV, but I was really enjoying the game before I hit 50. I tried everything the game had to offer me as a beginner (as far as I know): a DPS class, a tanking class, a healing class, crafting, more crafting, gathering, beast tribe dailies, random duty roulette – everything was fine in moderation. And new. And fun. Then I hit 50 (with the MSQ) and had to do all the story end-game content in the original game (ARR). This page shows my struggle, but it’s misleading. Each of those quests can have 3-7 steps with trips to several towns. And worst of all, they are sequential – it would be a lot better if you could just queue (30 mins as dps for the first one today) for all of them at the same time. But no, that’s probably 2 hours where you have to be available for up to an hour, so a planned session. Meh. As I wanted to get this stuff done (the above was written last night) I queued for Garuda (Hard) and waited in vain for an hour. Two awesome people in the novice network offered to help and while I was confused at first I learned something new: you can queue up unsynced and the 2 70s made quick work of Garuda and Titan (at Level 50, Hard) and not 15mins later I have this step done. Thank you, random strangers helping new players out! Thought about how I stand in regard to attaining the Heritage Armor for all races, once it comes out. So I made a list, I seem to love lists for MMOs. Undead: ohoh. 1 DK at 102 and a 102 Mage that was boosted to 60 by Refer a Friend, iirc. It’s been a while. Just checked all my blog posts and some chars. Apparently I did have a Level 90 boost at some point in Legion and I don’t remember using it. But I only have a Level 100 boost on my account. Either that one got upgraded or I must have used it, but on who? I can mostly rule out my Horde toons on my main server. Right now the info points to “Level 90 boost got upgraded” as I blogged about boosting my Dwarf Pally to 100, not 90, and the reputations also point to that. Addendum: If going off this MMO-Champion post which reads “Players with maximum-level (120) blood elves or dwarves who are Exalted with their faction” then I might not be so much out of luck, because then Undead und Worgen would just be the reputation (in addition to Legion+BfA leveling), for Draenei the DK would be eligible (if it ever reaches 120). But some of the “done” and “nearly done” above need to be changed. Guess I’ll have to wait for some confirmation and then change the above. With all this recent talk about the announcement of Borderlands 3 and all the Anthem news (and back and forth) it took a while, but then it hit me. I reevaluated which of the games in this supposed “looter shooter” genre I had played and what I liked and disliked about them. I should probably preface that the last time I actively played anything resembling a shooter was Quake 3 Arena and Action Quake 2. At the break of the century until maybe 2002 or 2003. Borderlands – got it on a sale, it wasn’t bad per se, but it didn’t really stick. I loved the art style but not the gameplay. Borderlands II – also got this on sale. While I didn’t play many hours I absolutely enjoyed it. For the most part. I was sneaking and sniping instead of going in guns blazin’ though. Destiny II – played the demo and absolutely loved it. Had it been available at that time I would’ve instantly bought it. So the hype died down, I wasn’t interested anymore when it launched and then I grabbed it when it was free. I played some and liked it. Mostly sniping and zoomed in scout rifle, though. Quake Champions – it’s pretty awesome but I guess that is because it feels exactly like Q3A to me. I played a bit but then other games took my attention again. Fun, but not worth my gaming time it seems. Warsow – played an evening with friends once. Was fun, but again, not fun enough to invest time. Now to the interesting part. I never liked the solo campaigns in shooters, I mostly played deathmatch or team deathmatch. And of course I played BL2 and Destiny mostly solo, although there were some events in Destiny, but there was hardly any interactions, might as well have been bots. So what struck me is that I actually hate getting upgrades and making decisions. “Is this weapon better than the other?” I DON’T KNOW AND I DON’T CARE. If it has more than 3 stats and I don’t know which one to use.. I even played through most of Quake with a single weapon and hated switching because I didn’t have ammo anymore. I’ve raided long enough to have had my share of minmaxing builds for a lifetime. This is more tedious than work. I have nothing against linear progression. Get new gun, replace old gun. Fine. Don’t make me compare 7 stats. I do not care a bit. OK, so why did I like Borderlands 2 and Destiny 2 again? I don’t know, surely not for the loot. Maybe I’ve just been away from shooters long enough that some pretty graphics and shooting enemies is good enough. I can’t tell you if the story is good. It’s better than what I know (Quake). Came out of work a little sooner today so I had time to finish the Suramar Insurrection quest line and unlock the Nightborne. Not yet sure what I’ll play though. Then I also managed to finish the Kul Tiran Humans quest line (what a bunch of useless running around) and created a Mage. Waiting for rested XP to build up now though. Then I ground out the missing 500 rep to Zandalari Trolls Exalted, now just the quest is missing and then I unlocked 6 out of 8 Allied Races, just the 2 Argus Alliance factions are missing. Finally my Night Elf Warrior managed to get the last level in Tiragarde Sound and is now Level 120, the 5th character in BfA to reach max level. Sadly I’m not in the mood for tanking right now, but we’ll see, maybe I’ll queue up for a random again in the next days before doing my quests. 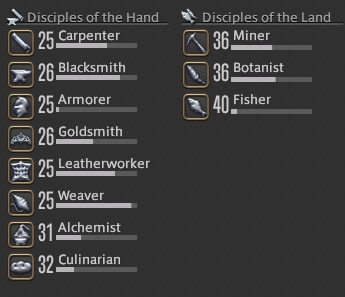 For crafting I’m a little undecided if I want to bring all of them to 30 or Culinarian to 37 first. One higher level to craft the daily stuff is kinda nice (better gear) and apparently there’s a good skill at CUL Level 37, according to this extensive guide. The last post about FFXIV has been nearly 2 weeks, but not for lack of play time. It’s more that it has been a little slow. I finished getting all the crafters to 25-27 and got most (if not all, need to check) Level 25 quests done, and the 3 gathering jobs are at 31/31/32. I am currently stuck in the ARR MSQ endgame it seems, and I need to catch up all the quests at 50 (that don’t even give a lot of XP) before I can continue there. That’s playing as a Bard. I also tanked my way to 50 as a Warrior and got to 30 as a White Mage with dungeon runs, but I don’t want to do that every day, so now I focused on Ixal dailies a little more. And yes, played a lot of WoW, but I think I logged in to FFXIV every single day, did the Ixal dailies most days and even sent the Retainers on missions a few time and visited the Gold Saucer. All in all I’m still having a lot of fun, but I was really let down that I now have to do like 60 quests at Level 50 before the expansion content starts, this killed my motivation to press on more than a little, although I enjoyed the MSQ pretty much up to Level 50. … only to notice that I need to do the Insurrection quest line. Meh. So much for this unlocking thing. I’ve been working on my NE Warrior the last few days, even being able to help more guildies who needed normal dungeons for their profession quests to fill up the ranks and so of course I ran out of rested XP after a while, sitting at 115. So what do you do in that case? Go out and enjoy the spring? Didn’t really work due to feeling horrible and not being able to stand up (sitting was fine, phew). So first I pushed my Dwarf Hunter from 70 to 75 in Icecrown until I had used up the rested XP. When that was done all too quickly, I bought some 90->110 AGI Leather Heirloom upgrades and moved my Human Rogue to Highmountain. I was kinda surprised how fast that went. 102 -> 107 in like 3h, and still some rested XP left. Oh, and the Orc Shammy is 120 for a few days, but I’m not really in the mood to grind out gear, so I’m just slowly doing a few WQs with good gear upgrades and might do some Honorbound rep to continue the War Campaign. 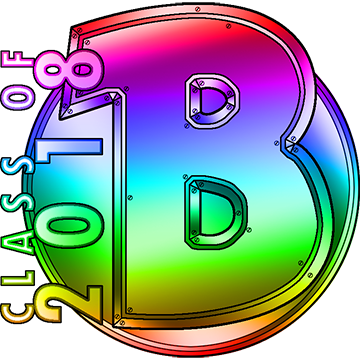 Plans for the near future? Rogue to 110, Warrior to 120, then… not sure. Maybe 2nd Druid to 110.